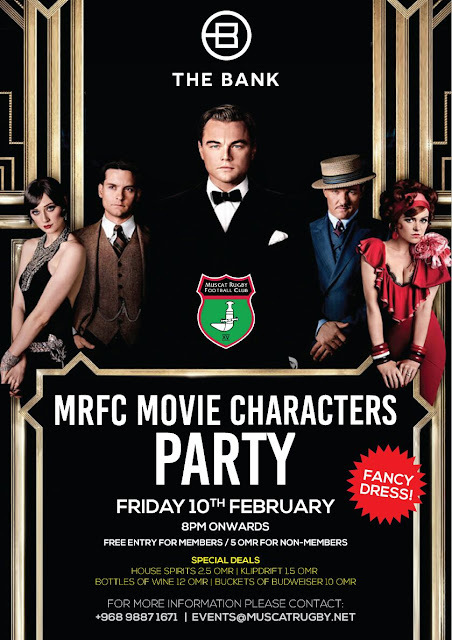 The MRFC are back again with another fancy dress party - attendees to their last 3 Halloween parties will know that these people take their costumes seriously, and I am expecting the same for this party coming up on the 10th of February at The Bank from 8pm. Tickets are free for MRFC members (just email events@muscatrugby.net and say you're coming so you can be added to the guest list - and then remember your card on the night) or just RO 5 for non members. There are a number of drinks specials available, and for the Saffa's among you, I'm reliably informed that there will be Coke (and not bebzi) to go with your Klippys. If you want to go, email events@muscatrugby.net or call or WhatsApp +968 9887 1671 - no tickets will be available on the door, this is a private party and you gotta be on the list to get in. You can see more information on the facebook event page. MRFC have their next home game against Bahrain on Friday 3rd of February at their pitch in Bowsher. Kick off is at 3pm, then on 10th of February at 3pm they play Doha at home before the fancy dress party.